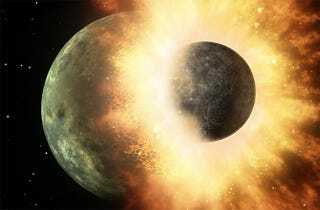 At long last, scientists have found the chemical fingerprints of Theia, the object the size of Mars which is believed to have crashed into the young Earth, creating debris that later formed the Moon. Evidence for the so-called "giant impact" theory comes from studies of oxygen isotopes in Apollo moon samples. "We have developed a technique that guarantees perfect separation" of oxygen isotopes from other trace gases, lead researcher Daniel Herwartz, with the University of Cologne in Germany, wrote in an email to Discovery News. The team studied several lunar meteorites and three basalt rock samples brought back by the crews of the Apollo 11, Apollo 12 and Apollo 16 missions, which took place between 1969 and 1972. "We also had soil samples from NASA, but this material is not ideal for determining the bulk oxygen isotopic composition of the moon, as lunar soil may be contaminated by micrometeorites and the like," Herwartz said. The scientists were seeking evidence of Theia, a mysterious Mars-sized object that is believed to have crashed into Earth about 4.5 billion years ago, sending a cloud of debris into space that later reformed into the moon. Most computer models predict that between 70 percent and 90 percent of the moon is Theia, which, like most planets in the solar system, should have a unique isotopic composition. If the moon was mostly Theia, scientists believe it would have a slightly different chemical makeup than Earth. Other models predict as little as 8 percent of the moon is Theia, with the rest of the material coming from Earth. Based on the slightly higher concentration of oxygen isotopes in the lunar samples, the actual mix of Theia and Earth in the moon may be closer to 50-50, but that has yet to be confirmed, the researchers wrote in a paper published in this week's Science. Meanwhile, other teams of scientists have been looking at titanium, silicon, chromium, tungsten and other chemical elements, but so far the lunar samples show no detectable differences from Earth samples. "This work is the first to claim to see such a difference in the isotopes of oxygen, and thus it may provide an important new constraint on the giant impact models, specifically on the size and composition of Theia," planetary scientist Robin Canup, with the Southwest Research Institute in Boulder, Colo., told Discovery News. "The reported difference between the Earth and moon is extremely small — small enough that I think there will be debate as to whether the difference is real or an artifact of how one interprets the data," she added. "Because this is such an important issue, this paper is likely to prompt additional work and critical debate on this topic, which will be great for the field no matter the final answer." Herwartz and colleagues plan follow-on studies to analyze ancient Earth rocks in an attempt to figure out what material was added on to Earth after the moon's formation to see if that accounts for the slight variation in oxygen isotopes. This post by Irene Klotz originally appeared at Discovery News. It has been republished with permission.